Show a thumbnail, a progress meter, in each tab. Move the tab bar from top to left, right, or bottom. The tab bar can be changed from horizontal to vertical. Show tabs with indent like a tree. Open "View Page Source" and "View Selection Source" in tab. This provides only unique features of old TBE2. You can use each features separately, because, actually the TBE3 is a meta package based on some tiny addons. See the list of addons in the TBE3. By the way, TBE3 doesn't have some features of TBE2, for example, "colored tabs", "lock/unlock tabs", "session management", etc. If you require them, you should use other additional extensions or the Tab Mix Plus. If you see any problem, see FAQ at first. If there is no solution, post a report to the issue tracker on the GitHub for each addon please. List of addons packed in the "TBE3"
Tree Style Tab: Moves the tab bar to the leftside or rightside of the browser, and show tabs like a tree. Multiple Tab Handler: "Close Right Tabs", "Close Left Tabs" and more features to operate multipe tabs at once. Informational Tab: Thumbnail in tabs, progress meter in tabs, emphasis of unread tabs, etc. Source Viewer Tab: Loads "View Page Source" and "View Selection Source" into tabs. Open Link in New Tab: Opens new tabs automatically for links to external websites. Open Bookmarks in New Tab: Opens new tab for any bookmark. New Tab from Location Bar: Opens new tab for any input to the location bar. Screenshots&Features This package provides following features. Select tabs, and choose a command. This is the simple usecase. 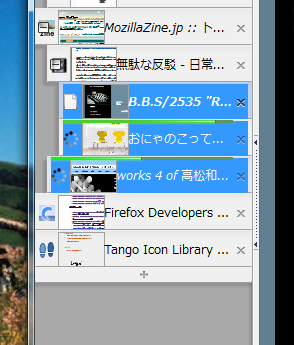 If you want tabs to be rearranged, please drag the favicon of tabs. If you don't like the behavior of tabs, you can change it. "Move tab (Firefox default)", "select tab (Multiple Tab Handler default)" or "switch tab (iRider compatible)" is available. You can select/unselect tabs by ctrl-click or shift-click, like as cells of Excel. This includes "Close Left Tabs" and "Close Right Tabs" features. 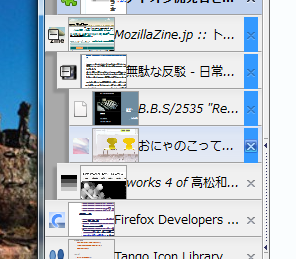 You can use them from the context menu of tabs. Tree example. New tabs from link (or etc.) are opened as children of the original tab. You can collapse/expand sub trees. It is convenient for too many tabs. When you close a tab which has collapsed sub tree, all of tabs in the sub tree will be closed only one action. Tab bar can bemoved to leftside, rightside, top, or bottom. Horizontal tree is also available. Moreover, vertical tab bar can be shown/hidden automatically. You can open new tab between existing tabs, dropping link or URL string there. New child tab can be opened automatically from the location bar, if the website is same to the current tab's. Of course, different website can be opened in new tab too. You can save/restore the tree of tabs over sessions, by Session Manager or other session-management addons. Drag and drop is available to modify relations of tabs and to rearrange. The behavior seems to be like "layer tree " of Adobe Illustrator/Photoshop. If you focus to the tab bar, Ctrl-Up/Down/Right/Left can be used to modify tree. Multiple Tab Handler can work with this. drag-and-do features of it will be more useful. This loads "View Page Source" and "View Selection Source" in tabs instead of new windows. Full of features in "View Page Source" window is also available in tabs, and those tabs can be reopened by "Undo Close Tab" because this uses session store API. By the way, this includes an UI to choose external viewer applications for Firefox 2's feature.